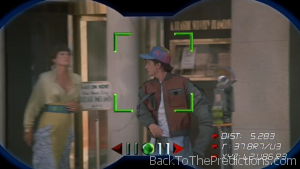 Marty Jr. is spotted walking along the sidewalk, flips off the woman in the black and white dress, and spins back around to see a woman coming out of a building. The sign above the window reads “A Plastic Surgery Franchise”. Plastic surgery exists in 2015 just as it existed in 1989 when the movie was made and 1985 when Marty came from, but it’s not as widespread as the movie implies. It also tends to be more discrete than what we see here…but then again this is California. You certainly wouldn’t see a plastic surgeon advertising a sale in our 2015.